K911 is a taxi service that transports dogs to vet visits, groomer appointments, the airport or anywhere they need to go. They can even transport in a medical emergency as they are equipped with stretchers and oxygen. Check out these links for seasonal and holiday pet safety tips! We live in an area where ticks are prevalent. These parasites can transmit many diseases including Ehrlichia, Rocky Mountain Spotted Fever and Lyme Disease. Symptoms of these diseases can include lameness, fever, anorexia, swollen joints and possible kidney impairment. 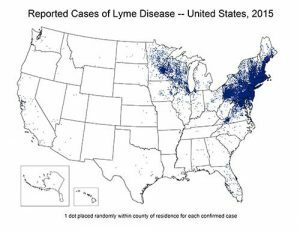 As you see in the map, our region has one of the highest incidences of Lyme disease in the country. The best protection for our canine friends is applying a flea/tick preventative year round. There are topical, oral, and collars to choose from, and your veterinarian can help you select the best choice for your pet and family. Another line of defense against Lyme disease is the Lyme vaccine. The veterinarians at Longwood Veterinary Center recommend the annual vaccine for all dogs. It is also recommended that our canine patients perform an annual blood test to detect for exposure to Lyme, Ehrlichia, and Anaplasma. Diagnostics and treatment vary and will be discussed with you upon results. Mosquitoes transmit heartworm larvae. If pets are not given preventatives, those larvae can develop into adult worms. This can lead to heart failure, lung disease, and sudden death if left untreated. Signs include cough, exercise reluctance, reduced appetite, etc. Treatment is available but is costly and uncomfortable for the pet. Talk to your veterinarian about heartworm prevention options. Generally speaking, we also recommend you feed a diet formulated for puppies until your dog is approximately 10 months of age. After this time you may slowly transition to an adult formula over a 4-6 week period. Dogs over 7 years of age may benefit from a senior formulated diet that contains supplements like glucosamine and omega-three fatty acids. Dietary recommendations will be discussed at each health visit while we assess your pet’s weight and assign a body condition score. Our hospital believes in the benefit of nutritional management of disease and we carry prescription diets as part of a multi-pronged approach to disease management. Read our blog post written by Tufts University Veterinarian Lisa M. Freeman, DVM, PhD, DACVN about the risks of grain free food. Your veterinarian may prescribe oral medication for your dog or puppy. Do you know how to successfully medicate your pet? Here are some helpful hints from Vet Med and Vet Street. Regular health care is especially important for older pets. Diseases caught early are often more easily managed and may have better outcomes. The mission of Canine Partners for Life is to increase the independence and quality of life of individuals with medical, physical, developmental, and cognitive disabilities by pairing them with a professional, trained service and companion dog. We are proud to support Canine Partners for Life by annually donating preventative health care or any surgical or medical care that some of their special dogs may need while in training. Learn more about the important roles these special dogs play in people’s lives. 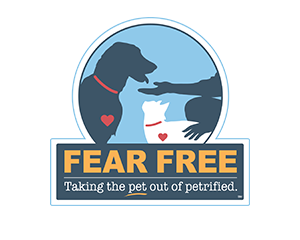 Fear Free Happy Homes is an online community offering education, tips, and deals to brighten your pet’s lives. Environmental enrichment and strengthening the human-animal bond, along with ways to reduce stress and anxiety are topics commonly addressed. Sign-up here.